procedures and requirements to apply for and obtain an H1B Work Visa and Sponsorship Employment in the USA. What is the H1B Quota, and How Does it Work ? Foreign Nationals that require an H1B visa to work in the USA, must first obtain an H1B Sponsorship Employment Offer. The H1B Job must meet all the minimum H1B visa employment requirements in respect to occupation, job level, job duties, salary compensation. The Sponsorship Job Offer Must be obtained from a US Corporation that will File the H1B Visa Application. Individuals can Not apply for their own H1B visas, only US Corporations can apply on their behalf. What is an H1B Visa ? The H1B is a non-immigrant visa in the USA under the Immigration & Nationality Act, section 101(a)(15)(H). It allows US employers to employ foreign workers, from all over the world, in specialty occupations. The US Government introduced the H1B visa to provide highly skilled International Professionals and/or International Students, from all over the World, the opportunity to live and work in America. The H1B is the most sought after US work visa and US Immigration requires 'every' foreign national to obtain a visa in order to legally work in America. * individuals can NOT sponsor or apply for their own H1B visa. Only US Employers can. The H1B visa enables US employers to hire foreign professionals to work in the US for up to a total of six (6) years. One of the things that makes the H1B so desirable is that, unlike many other nonimmigrant visa categories, it is a "dual intent" visa which means the H1B worker can continue on to obtain a Green Card for Permanent Residency in the USA. In addition, this benefit means that an H1B visa will not be denied simply because a person has intentions to become a permanent resident of the United States of America. Green Card holders can also continue on to then become US Citizens. The initial length of time that an H1B visa is issued for is three years, which can then be extended for an additional three years to make a combined total of six (6) years. (3) the employee to work for more than one US Employer simultaneously. The H1B worker's family may also be permitted to live in the US during the period that the H1B visa is in effect, but can not be a paid employee while on an H4 visa. An H1B holders Spouse and children (under the age of 21) can move to and live in teh USA with the H1B holder - but they can not work unless they obtain their own work visa. According to the USCIS: H1B workers may only work for the petitioning USA employer and only in the H1B activities described in the petition. The petitioning U.S. employer may place the H1B worker on the worksite of another employer if all applicable rules (e.g., Department of Labor rules) are followed. H1B workers may work for more than one USA sponsor, but must have a Form I-129 petition approved by each sponsor (employer). 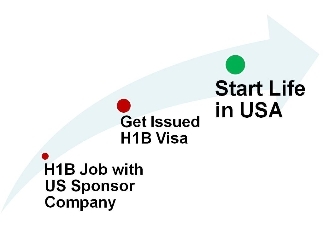 The H1B transfer rule allows H1B holders to transfer their H1B visa to work for a new H1B sponsor company. I-94 card: as an immigrant, when you arrive in the U.S., an arrival/departure record card is issued and placed in your passport next to your visa. This is called an I-94 card that permits a foreigner to be in the U.S. (as opposed to visa that provides the right to travel in and out of the U.S. in a certain status, eg. H1B visa status). The U.S. immigration official at the U.S. port of entry will review the foreigner's immigration documents (eg. H1B visa) and stamp the I-94 card with an expiry date consistent with the visa expiry. It should be noted that the immigration official has the power to limit a foreigner's stay irrespective of the visa expiration. The I-94 card is removed when a foreigner departs the U.S.
Each year there is an H1B Quota. The H1B visa quota is also sometimes referred to as the H1B cap. The quota system is how the US Immigration Bureau (USCIS) determines and controls the number of new H1B visas that can be applied for and issued during a Fiscal year. To get issued an H1B visa, a Foreign national must work in (obtain H1B sponsorship employment) one of the specialty professions that qualifies for the H1B visa program. H1B Visa Qualifying Professions and Occupation categories are typically for H1B jobs in the fields of IT, Computing, Finance, Accounting, Banking, Marketing, Advertising, PR, Sales, Recruiting, Engineering (all types), Teaching, HealthCare/Medical, Legal, Lawyers, Networking, Telecoms, Business, Management, Scientific Research. Aside from documenting that the H1B job position offered is in a specialty occupation and that the employee has the appropriate credentials for the H1B job, the US employer needs to verify that the H1B visa worker is being paid the prevailing wage for the work being performed. Current CV/Resume describing in detail employment history including: name & address of employer, job title, month/year commenced employment & month/year concluded employment, type of business, duties performed, full/part time. For every H1B visa petition filed with the USCIS, there must be included a Labor Condition Application (LCA) certified by the U.S. Department of Labor. The LCA is designed to ensure that the wage offered to the H1B non-immigrant worker must meet or exceed the "prevailing wage" in the area of employment. The LCA also contains an attestation section designed to prevent the program from being used to import foreign workers for the purpose of breaking a strike, or for the purpose of replacing U.S. citizen workers. Under the regulations, LCAs are a matter of public record. Corporations hiring H1B workers are required to make these records available to any member of the public who requests to look at them. Copies of the relevant records are also available from various web sites, including the Department of Labor. Theoretically, the LCA process appears to offer protection to both USA and H-B workers. However, according to the U.S. General Accounting Office, enforcement limitations and procedural problems render these protections ineffective. Ultimately, the employer, not the Department of Labor, determines what source it will use to determine the prevailing wage for an offered position, and it may choose among a variety of competing surveys, including its own wage surveys, provided that such surveys follow certain defined rules and regulations. The USCIS has announced that after completing a policy review that it was clarifying that to avoid H1B quota limits, individuals who spent one year outside of U.S. and did not exhaust their entire six year term can choose to be re-admitted for "remainder" of initial six-year period without being subject to the H1B visa cap. The USCIS has also announced that after completing a policy review that it was clarifying that "any time spent in H4 status will not count against the six-year maximum period of admission applicable to H1B workers. H1B visa workers are granted a number of rights. The employer must give the worker a copy of the LCA. The employer must pay the worker at least the same wage rate as paid to other employees with similar experience and qualifications or the local prevailing wage for the occupation in the area of employment, whichever is higher. The employer must pay for non-productive time caused by the employer or by the worker's lack of a license or permit. The H1B employer must offer the worker fringe benefits on the same basis as its other employees. Also, the employer may not require the H1B worker to pay a penalty for leaving employment prior to any agreed date. However, this restriction does not preclude the employer from seeking "liquidated damages" pursuant to relevant state law. Liquidated damages are generally estimates stated in a contract of the anticipated damages to the employer caused by the worker's breach of contract. US workers and job applicants may also have certain rights under the H1B programs. US workers employed by an H1B dependent or willful violator employer may not be laid off within 90 days before or after the employer files a USCIS petition to employ an H1B worker in an essentially equivalent job. In addition, an H1B dependent employer or willful violator must offer the job to any US worker who applies and is equally or better qualified for the job than the H1B worker. The US Department of Justice has the authority to investigate complaints of failure to hire qualified US workers. No employer of H1B visa workers may intimidate, threaten, blacklist, discharge, or in any other manner discriminate against any employee, former employee, or job applicant for disclosing violations of H1B visa provisions or for cooperating in an official investigation of the employer's compliance. US workers and H1B workers may also examine the public disclosure documents that the employer is required to maintain that provide information about the employer's compliance with the attestation elements.